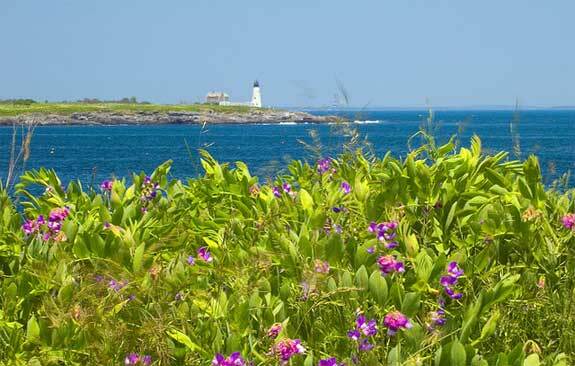 East Point Sanctuary in Biddeford Pool overlooks Woods Island Light. Photo courtesy of Brent Danley. Hundreds of professional and amateur ornithologists visit Maine each year to view its incredible birds. It’s no surprise that the state is so popular, given its 331 species of birds that live in dozens of diverse habitats. From coastal shorebirds to warblers living in the inland mountain region, Maine has spectacular bird watching opportunities. Visit one of its ten bird sanctuaries for a better chance to spot multiple rare bird species. East Point Sanctuary is located on the tip of Biddeford Pool, a large tidal pool south of Saco Bay. Common loons, gulls, black-backed gulls, black-capped chickadees, song sparrows, crows, herring gulls, red-breasted mergansers, robins, and dark-eyed juncos are commonly seen in this area. There is a one-mile trail through the sanctuary that takes approximately 30 minutes to complete. Look out for poison ivy and please do not take dogs into the sanctuary. There is limited on-street parking in the area, and the sanctuary is open year-round during the daytime. Prouts Neck is a peninsula jutting from the town of Scarborough. There are several miles of self-guided nature trails and boardwalks leading through the woods. No parking is permitted because the area is a private summer colony. Bicycling and hiking are the preferred methods of getting around. Look for sandpipers, plovers, and whimbrels in this beautiful sanctuary. The hiking trails pass near a studio used by Winslow Homer, a famous American painter. In 1946, Maine governor Percival Proctor Baxter donated 32 acres of land to the city of Portland to retain as a public recreational area. As the largest undisturbed forest in Portland, this land is beloved by birders. With mixed forest, conifer forest, red pines, meadows, and ponds, this nature reserve has several habitats. Look for crows, kestrels, robins, owls, chickadees, blue jays, hawks, woodpeckers, finches, sparrows, falcons, mockingbirds, nuthatches, pheasants, and warblers in this sanctuary. The nature reserve is open to the public year-round. The 85-acre Fore River Sanctuary, located in Portland, has the city’s only natural waterfall. The saltwater marsh provides a unique habitat for birds. Keep an eye out for red-throated loons, kestrels, chickadees, warblers, falcons, pheasants, and titmice. This sanctuary is open year-round; call 207-775-2411 for more information. Gilsland Farm is the site of Maine’s Audubon headquarters. The farm has meadows, woodland, shrubs, and tidal flats. These diverse habitats support bobolinks, meadowlarks, red-tailed hawks, thrushes, finches, and shorebirds. When walking the property’s trails, look for white-tailed deer, black woodchucks, red fox, and weasels. Gilsland Farm is found five miles north of Portland. The grounds are open from dawn until dusk, while the nature center is open during normal business hours. Call 207-781-2330 for more information. Mast Landing Bird Sanctuary is located just west of Freeport. This 140 acre property features over 3 miles of marked trails suitable for hiking, walking, snowshoeing, and cross-country skiing. The salt marsh, apple orchard, stream, forest, and lowland habitats are home to shorebirds, songbirds, and nesting woodcock. Visitors may also see mink, fisher, deer, snowshoe hare, great blue herons, broad-winged hawks, porcupines, and hairy woodpeckers. Found at the southern end of Robinhood Cove, the Josephine Newman Wildlife Sanctuary features woods, tidal mud flats, wildflower meadow, and marshland. The result is a wide variety of shorebirds, songbirds, raptors, and other bird species. The 119-acre sanctuary has nearly 3 miles of marked trails. The sanctuary is open to the public from dawn until dusk. Located on 330-acre Hog Island just south of Bremen on Muscongus Bay, the Todd Wildlife Sanctuary is a spectacular bird watching destination. Visitors must come via personal watercraft, but there are no public boat launches on the island. This is a popular area to visit with a sea kayak. The island consists of white spruce, red spruce, white pine, birch trees, and numerous clearings. The island is home to 150 bird species, including common eider, double-crested cormorants, black guillemot, and osprey. This sanctuary is open to the public from dawn until dusk. Birdsacre Sanctuary is dedicated to the memory of pioneering ornithologist and photographer Cordelia J. Stanwood. The 200 acre property is home to hawks, owls, thrushes, songbirds, and numerous other species. Open every day during daylight hours, the facility also offers a nature center with Stanwood’s original work and personal memorabilia. To get to the sanctuary, take High Street southwest of Ellsworth for two miles. Call 207-667-8460 for more information. The Thorncrag Bird Sanctuary is located just northwest of Lewiston. The 372-acre sanctuary is a forested preserve surrounded by urban and suburban development. In addition to birdwatching, it is a popular location for picnicking, walking, hiking, sledding, cross-country skiing, snowshoeing, and skating. No dogs are permitted in the sanctuary to protect its animal population. Loons, orioles, finches, sparrows, blackbirds, starlings, hawks, mergansers, cormorants, woodpeckers, nuthatches, warblers, and falcons are commonly spotted in the sanctuary. The area is open year-round during the day time.